Tickets This is where you can find tickets. Student note: If you are buying a ticket with Student Price, you must show a valid Student ID in the door of the bus before departure. If you fail to do so, you will need to pay the difference between Student and Adult Price in the bus before departure. The dates here in our online sales system are updated every Monday. 5 – Paypal Login: on this part, as we use Paypal to receive payments, it may ask you to login in your Paypal Account. If you have an account you can simply login and finish the payment. If you dont have it, you can either create one or just click on the button below saying Pay With Debt Or Credit Card. 6 – It will ask then your card information. Fill the form and finish the payment. Please note that a small booking fee (2.9%+0.35c) is applied on tickets purchased online. 7 – Finished! You will see the screen saying Payment Completed. 8 – Please let us know by phone, whatsapp or facebook that you finished the payment just to make sure we have seen your payment and completed your booking. You don’t need to print anything. Just please ask the passengers to bring their ID so we can check them on the list in the bus. Our meeting point is on Jervis Street in front of the pub The Church Bar, Dublin 1, Dublin, Ireland. It’s only 5 minutes walking from Temple Bar, The Spire on O’Connel Street or Parnell Street. We always ask everyone to be in the meeting point 15 min prior departure. 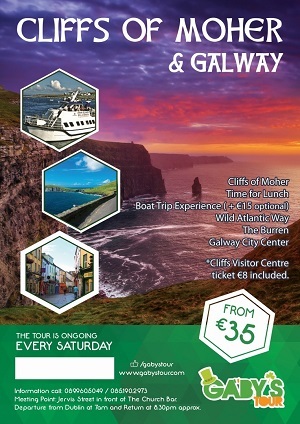 – Cliffs of Moher & Galway – Meeting Point at 6.45am, departure at 7am and return at 8.30pm approx. 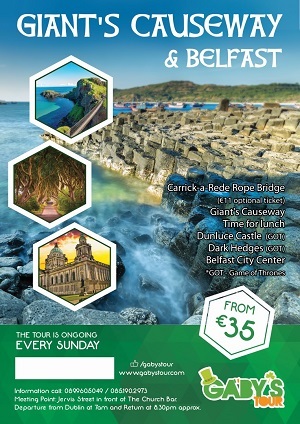 – Giant’s Causeway & Belfast – Meeting Point at 6.45am, departure at 7am and return at 8.30pm approx. 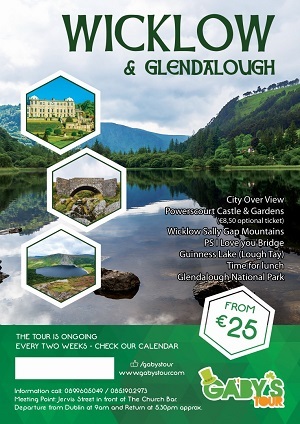 – Wicklow Tour – Meeting Point at 8.45am, departure at 9am and return at 5.30pm approx. THANK YOU FOR CHOOSING GABY’S TOUR! TICKETS ARE NOT REFUNDABLE AND DATES ARE NOT CHANGEABLE, unless you get in touch with us 48h before the departure time. Any cancellations made within 0-24h of the departure time will not be refunded. We will analize each case and situation. Exceptions may be made in extreme circumstances as sickness, flight delay, natural disaster, etc, (being called to work is not accepted as an extreme situation). In case of an exteeme situation, the customer may be entitled to a partial refund, discounting administrative fees by the last minute cancellation. Proof of these circumstances will be required for any full or partial refund being done. Any refund which has been agreed with the management of Gaby’s Tour will be made in 28 days since the day of the agreement. The responsability to arrive in the meeting point 15 minutes prior departure is of the passenger. Departure times are stated here on the website, on the posters and on each ticket. The tours will leave on the departure time and will not wait for any passenger who is not present in the meeting point (regardless of payment received). No refund will be made if a passenger don’t show up on the stated day and time and the tour will not be re booked. 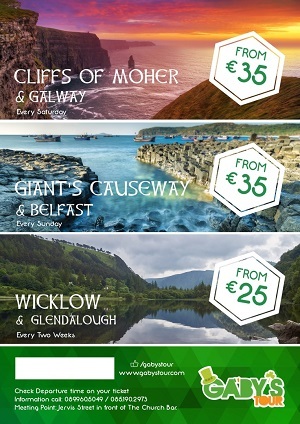 The fee to re-book a ticket is €20pp which have to be paid in advance to have a second booking done. Be aware the public tranport in Dublin is not so good in the weekends, so please make sure you check times of buses, trains and luas. If you don’t have public transport to arrive on time, you need to organize a taxi, uber, transfer, hostel/hotel, a friend’s house to stay the night before, etc. Tickets will not be refunded in case you realize there’s no public transport to arrive on time after buying it. You must check that before buying any ticket. As soon as the tour has begun, Gaby’s Tour guides will explain the places, the itinerary, give ideas and suggestions of what to do in each place but is very important that customers return to the bus on the stated time by the guide of the tour. Punctuality is the passenger’s responsability. Our tours have a schedule and we respect everyone’s time. Any passenger who is not present in the meeting point or in the bus at the time the guide asked to come back, will be left behind and no refund will be made. The company reserves the right to substitute other vehicles of similar quality, including those of other operators, for all or part of the hiring. The company gives its advice on journey times in good faith but does not guarantee the completion of any journey at a specific time and will not be liable for any loss or inconvenience caused by breakdown or other delay, furthermore any changes made to the agreed itinerary after the time the booking was excepted may not be possible to change due to the way our business uses a time slot system to take in bookings and if any change conflicts with this we do not guarantee to have a vehicle free to assist with this change and any financial cost to the customer who is forced to make alternative travel arrangements will be done so at the clients cost as our vehicle will be free to to the agreed trip/s at the stated time. Where the company arranges any additional services from a secondary body at the request of a customer such as vehicles, tickets, meals, accommodation or any other services it does so as an agent for and on behalf of the customer and on the express condition that the company shall not be responsible for any loss, damage, injury or delay or in the contingence howsoever caused as a result of any such arrangements. Any T&C`s imposed by such secondary bodies through the company shall be binding on the customer as if they had directly contracted such services. Passenger`s property – the company will not except liability for any damage to or loss of any property, which belongs to any passenger left in the vehicle. Passengers leaving any personal property on any company vehicle do so at their own risk. Any passenger who`s conduct is disruptive or threatening towards the driver, the guide or any passenger will be removed from the vehicle on the driver`s authority. The customer will be held responsible for the conduct of passengers and for any damage caused to the vehicle by passengers during the hiring. If you are bringing any child under 5 years of age in our tours, you must know that all kids must be seated in a car seat or booster seat in the bus. Children are not allowed to travel in anyone’s lap for safety and health reasons. These car seats are not supplied by Gaby’s Tour. We may try to get it if we are told 48h prior departure. Otherwise it’s the parents or guardians’ responsability to bring it to the bus. Any children without it will not be allowed to join the tour as the driver can be fined by Gardai and it is dangerous for the kid. In this case no refund will not be made. About discount, as we work a low price basis and have a limited number of seats, we can’t let kids go for free but we can offer a discount for children from 0 to 7 years of age. Any kid aged from 8 years old will pay normal ticket price. Please note that a small booking fee is applied on tickets purchased by card either online or at the office. We DO NOT charge booking fees for tickets purchased in cash at our office, by bank transfer or through our agents & partners. Booking fee only occurs if you pay by card. For online payments in our website we use the Paypal System. The booking fee is 2.9%+0.35c per ticket. For card payments in our office we use SumUp Payments Ltd. The booking fee is 2.75% per ticket.